Chiapas, Mexico, July 20. “Here below, where our voices are born, we respond and we raise our voices and our solidarity against the death that threatens us. Here below, we know that we only have our solidarity to confront political and economic power and its violence,” stated members of the campaign against political repression and sexual torture, in the context of a week of solidarity with the Zapatista support bases (BAEZLN), who were attacked on 24th June in the community of El Rosario, official municipality of Ocosingo. In the Week of Solidarity organized by the Network against Repression, from 13th to 19th July, the following were carried out: radio programmes, political-cultural gatherings, seminars (or seedbeds), informative and denunciatiory actions, solidarity rallies, painting, information tables, banners, stencils, leafleting and brigades, both in northern, central and southern Mexico, and in countries in solidarity. “We are still uniting in a cry though which we can awaken solidarity and awareness, knowing that no one is alone while their struggle is that for a truly just world,” express adherents and sympathizers to the Sixth from Madrid in a communique. “This is the third denouncement made by the Zapatista authorities, since in August 2014 and in May 2015, similar attacks occurred made by the same group of people. The bad government tries to portray them as conflicts between indigenous, when actually they are actions prepared, financed and protected by the Mexican authorities, which aim to destabilize the just Zapatista struggle,” say La Adhesiva from Barcelona. “The continued aggression against our compañer@s and brothers and sisters, the Zapatista support bases from the village El Rosario, in the autonomous municipality of San Manuel, committed by paramilitary groups from the ejido El Pojkol, shows that the peace of the Mexican government and its masters, shoots to kill,” say anarchists, libertarians and anti-authoritarians in solidarity from Greece. “Members of the counter-cultural scene, Punx and redskins, support the BAEZLN in the construction of their autonomy. The rulers of Mexico, the bad government and their shock troops, better known as paramilitaries, wanted to destroy the work they have been building for more than 20 years,” they said from Guadalajara, Jalisco, Mexico. 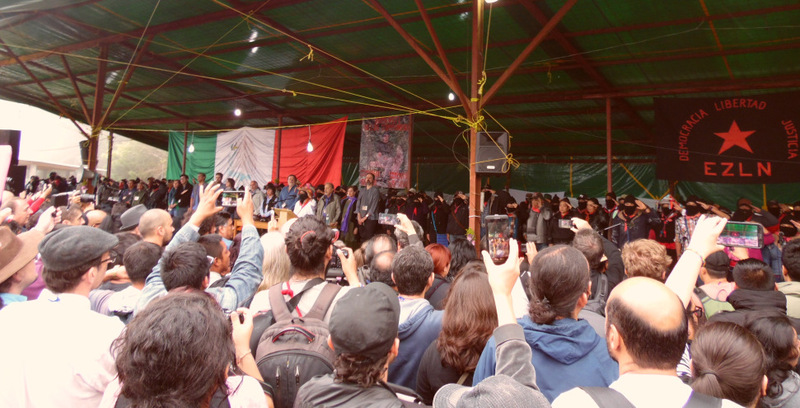 “Women, alternative groups, and those of us who choose to act or be different from the establishment, are resisting the storm spoken of recently by our Zapatista compañeros and which is manifested in repression, selective assassinations and forced disappearances” say adherents and sympathizers to the Sixth from Monterrey, Nuevo Leon. “We ask NOTHING from Peña Nieto and Velasco Coello, one of the heads of capitalist hydra, for to ask or demand true justice goes against their criminal and repressive nature,” they added. “So the first thing I want to tell the brothers and sisters around the world in their languages, dialects, ways, times and geographies, is thanks, really. They have given a beautiful lesson, not only to those people up above who distribute alms, but to the governments who abandon their obligations and promote destruction”, said Subcomandante Galeano, on 10th August, 2014, in La Realidad Chiapas, about the support for the reconstruction of the school and autonomous clinic, destroyed after the attack by Cioac-h, who also kidnapped, tortured and murdered the Zapatista teacher Galeano, as the Chiapas insurgents promptly denounced.